An Armenian soldier was killed in Nagorno Karabakh in a fresh ceasefire violation by Azerbaijan that reportedly occurred within hours after a “reinforced monitoring of the Line of Contact” conducted by international mediators. According to Karabakh’s Defense Ministry, 20-year-old Armen Martirosyan was fatally wounded at a position in the northern direction of the line of contact in an incident that happened at around 8 pm on May 11. It said Azerbaijan continued overnight to violate the terms of the ceasefire verbally agreed after a four-day war on April 5. 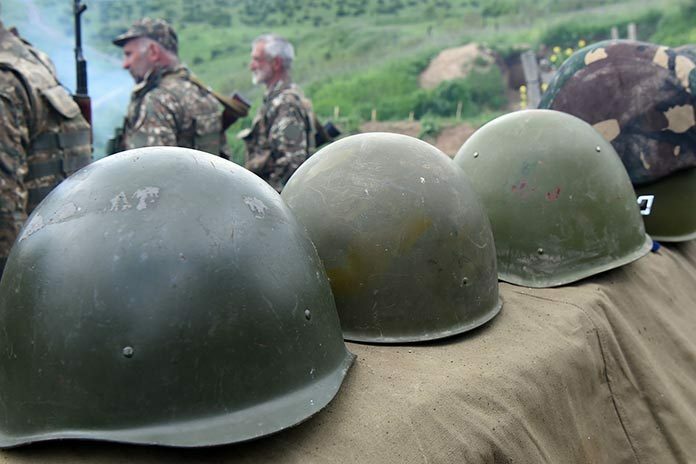 “Starting at 7:30 pm the enemy began to violate the ceasefire regime using firearms of different calibers, grenade-launchers and mortars, and the violations continued into May 12,” Karabakh’s Defense Ministry said. Earlier on May 11, a ceasefire monitoring by an Organization for Security and Cooperation in Europe (OSCE) mission went on without any reported incident in the northwestern direction of the village of Talish in Karabakh’s Martakert district. The area was one of the hot spots during the April 2-5 hostilities in which scores of Armenian and Azerbaijani soldiers were killed. The situation in the Talish direction has remained tense also after the cessation of military operations, with loss of life in sporadic gunfire periodically reported from there. In a statement released today, Armenia’s Ministry of Defense said that the latest fatality in Karabakh that occurred within hours after an OSCE monitoring shows that “the Azerbaijan side ignores the mediatory efforts on the Karabakh conflict settlement.” It said that this circumstance once again proves the need for a prompt introduction of mechanisms for investigating incidents.